[EAN: 9781334823282], New book, [PU: Forgotten Books, United States], Language: English . Brand New Book ***** Print on Demand *****. Excerpt from Index to Massachusetts Legislative Documents, 1883-1899 In order to maintain consistency and continuity, the format for each index entry is the same as those of the Blouin and Research Bureau indexes. The first two digits represent the year the document was issued; the letters, H or S, represent the branch of the General Court; and the number following the letter represents the individual document. Thus, 83h255 is House document number 255 issued in 1883. Compiling this index was not without some difficult language related problems. Terminology was often archaic and had to be updated. For example, instead of intoxicating liquors, alcoholic beverages was used. Also, mentally ill was substituted for insane and mentally handicapped for such terms as feeble-minded or idiotic. There was also a problem understanding some of the legal terminology involving bankruptcy, contracts and real estate due to the compiler s lack of knowledge in those areas. Another problem was the lack of consistency with the forms of corporate and agency names, which appeared to be based on the whims of the bills authors. Cross referencing was one solution, but often the final decision on the form of a corporate entry was based on which name was most consistently employed. A third major problem was the lack of consistency in terminology used in the documents. Language involving transportation, sewage disposal and municipal utilities, to name a few, got extremely confusing as shifts in terminology evolved over the years. In spite of the problems it was rewarding and exciting to observe political and social issues emerging and passing away over time. There was a definite emphasis on banking, insurance, and real estate throughout the entire period. The growth of railroad and street railway industries is also well documented. Local transportation, water supply and municipal utilities become more important as the years progress. Issues that appeared between 1883 and 1899 that are still with us today include an assortment ranging from abortion and alcohol education in schools to gypsy moth extermination. Social issues that are well documented include religious freedom, women suffrage, and immigration. While it can be admitted that most of the indexing was tremendously tedious, the discovery of these pearls of legislative history and the knowledge that they would become more accessible to researchers, made the index come alive and take on a purpose that made the whole project worthwhile pursuing. About the Publisher Forgotten Books publishes hundreds of thousands of rare and classic books. Find more at This book is a reproduction of an important historical work. Forgotten Books uses state-of-the-art technology to digitally reconstruct the work, preserving the original format whilst repairing imperfections present in the aged copy. In rare cases, an imperfection in the original, such as a blemish or missing page, may be replicated in our edition. We do, however, repair the vast majority of imperfections successfully; any imperfections that remain are intentionally left to preserve the state of such historical works. [EAN: 9781334823282], New book, [PU: Forgotten Books, United States], Language: English . 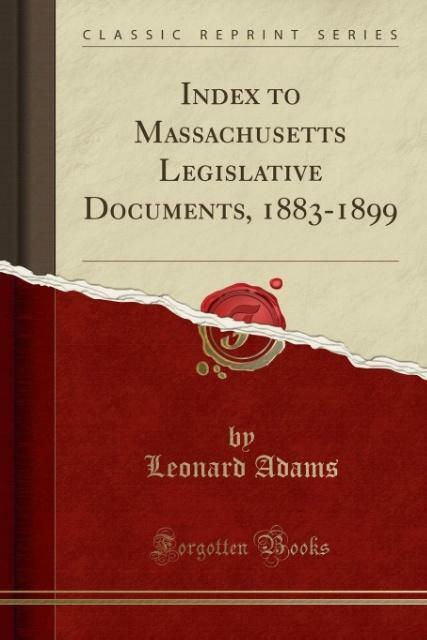 Brand New Book ***** Print on Demand *****.Excerpt from Index to Massachusetts Legislative Documents, 1883-1899 In order to maintain consistency and continuity, the format for each index entry is the same as those of the Blouin and Research Bureau indexes. The first two digits represent the year the document was issued; the letters, H or S, represent the branch of the General Court; and the number following the letter represents the individual document. Thus, 83h255 is House document number 255 issued in 1883. Compiling this index was not without some difficult language related problems. Terminology was often archaic and had to be updated. For example, instead of intoxicating liquors, alcoholic beverages was used. Also, mentally ill was substituted for insane and mentally handicapped for such terms as feeble-minded or idiotic. There was also a problem understanding some of the legal terminology involving bankruptcy, contracts and real estate due to the compiler s lack of knowledge in those areas. Another problem was the lack of consistency with the forms of corporate and agency names, which appeared to be based on the whims of the bills authors. Cross referencing was one solution, but often the final decision on the form of a corporate entry was based on which name was most consistently employed. A third major problem was the lack of consistency in terminology used in the documents. Language involving transportation, sewage disposal and municipal utilities, to name a few, got extremely confusing as shifts in terminology evolved over the years. In spite of the problems it was rewarding and exciting to observe political and social issues emerging and passing away over time. There was a definite emphasis on banking, insurance, and real estate throughout the entire period. The growth of railroad and street railway industries is also well documented. Local transportation, water supply and municipal utilities become more important as the years progress. Issues that appeared between 1883 and 1899 that are still with us today include an assortment ranging from abortion and alcohol education in schools to gypsy moth extermination. Social issues that are well documented include religious freedom, women suffrage, and immigration. While it can be admitted that most of the indexing was tremendously tedious, the discovery of these pearls of legislative history and the knowledge that they would become more accessible to researchers, made the index come alive and take on a purpose that made the whole project worthwhile pursuing. About the Publisher Forgotten Books publishes hundreds of thousands of rare and classic books. Find more at This book is a reproduction of an important historical work. Forgotten Books uses state-of-the-art technology to digitally reconstruct the work, preserving the original format whilst repairing imperfections present in the aged copy. In rare cases, an imperfection in the original, such as a blemish or missing page, may be replicated in our edition. We do, however, repair the vast majority of imperfections successfully; any imperfections that remain are intentionally left to preserve the state of such historical works. [EAN: 9781334823282], New book, [PU: Forgotten Books], This item is printed on demand for shipment within 3 working days. In order to maintain consistency and continuity, the format for each index entry is the same as those of the Blouin and Research Bureau indexes. The first two digits represent the year the document was issued; the letters, H or S, represent the branch of the General Court; and the number following the letter represents the individual document. Thus, 83h255 is House document number 255 issued in 1883. Compiling this index was not without some difficult language related problems. Terminology was often archaic and had to be updated. For example, instead of intoxicating liquors, alcoholic beverages was used. Also, mentally ill was substituted for insane and mentally handicapped for such terms as feeble-minded or idiotic. There was also a problem understanding some of the legal terminology involving bankruptcy, contracts and real estate due to the compiler's lack of knowledge in those areas. Another problem was the lack of consistency with the forms of corporate and agency names, which appeared to be based on the whims of the bills' authors. Cross referencing was one solution, but often the final decision on the form of a corporate entry was based on which name was most consistently employed. A third major problem was the lack of consistency in terminology used in the documents. Language involving transportation, sewage disposal and municipal utilities, to name a few, got extremely confusing as shifts in terminology evolved over the years. In spite of the problems it was rewarding and exciting to observe political and social issues emerging and passing away over time. There was a definite emphasis on banking, insurance, and real estate throughout the entire period. The growth of railroad and street railway industries is also well documented. Local transportation, water supply and municipal utilities become more important as the years progress. Issues that appeared between 1883 and 1899 that are still with us today include an assortment ranging from abortion and alcohol education in schools to gypsy moth extermination. Social issues that are well documented include religious freedom, women suffrage, and immigration. While it can be admitted that most of the indexing was tremendously tedious, the discovery of these pearls of legislative history and the knowledge that they would become more accessible to researchers, made the index come alive and take on a purpose that made the whole project worthwhile pursuing.